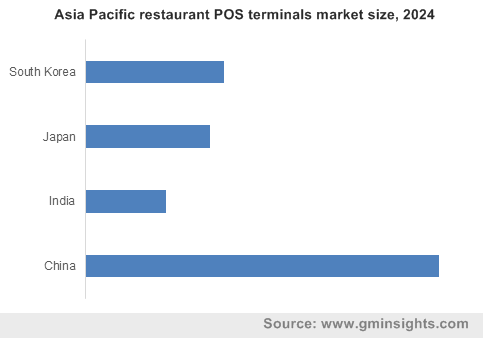 Restaurant POS Terminals Market size valued at over USD 10 billion in 2017 and will grow at a CAGR of 13% from 2018 to 2024. The worldwide industry shipments are expected to exceed 20 million units by 2024. 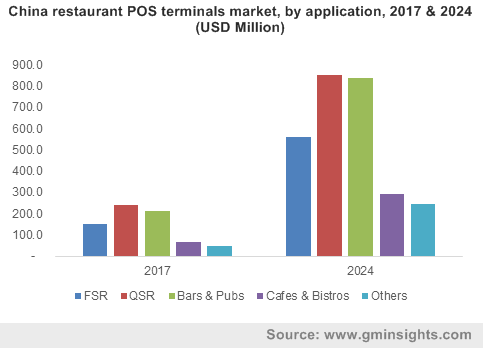 The restaurant POS terminals market is witnessing a high growth due to the increased adoption of such payment solutions in several application segments including FSR, QSR, etc. With a rise in the establishment of food outlets to serve different types of food items to customers, the demand for such advanced solutions will grow rapidly. FSRs are offering multicuisine dishes due to the presence of customers from different regions or countries, who have different tastes and interest in food items. Such factors are driving the establishment of numbers of restaurants. Manufacturers in the market are targeting such restaurants with a large customer base and where the requirement for effective sales & inventory management solutions are required. The players provide solutions that are customizable based on the business operations of restaurants. It allows food outlets to manage their sales, payments, and stocks with the help of a single solution, thereby reducing the additional cost of installing multiple systems. The technological changes in the restaurant POS terminals market are forcing food outlets to adopt modern solutions in their facilities to simplify the sales tasks and customer engagement operations. EMV-enabled devices are witnessing a high adoption in the market due to the increased payment flexibility with the application of contactless chip cards. It allows customers to pay their restaurant bills without entering their PINs, thereby enhancing the security and safety of their account details. Such devices are being widely adopted in FSRs due to the high budget range of these outlets. These technological solutions are expected to drive the adoption of secured and advanced payment options in the industry. The growing adoption of mobile technologies in the restaurant POS terminals market is providing several advantages to food outlets including increased sales, customer experience improvements, improved security, efficient & accurate transactions, accommodation of the growing transaction volumes, less expensive, easy migration to EMV, and accepting mobile wallet payments. These benefits allow small restaurants to get all the functions that were performed in fixed terminals done at a very affordable cost. Increased mobility of these devices allows these food outlets to provide payment options to customers at their doorsteps with the use of cards or mobile wallets, thereby accelerating the adoption of these solutions in food delivery applications. POS software solutions are witnessing a rapid adoption in the restaurant POS terminals market due to the increased requirement of such solutions for enhancing the hardware compatibility and accessibility of different components integrated into the system. The system includes several hardware components that need to be managed and operated with programming commands. The software solutions offer the user a platform to operate these components whenever it is required. Moreover, these software solutions allow the user to perform several other business functions that simplify the tasks such as sales or stock reporting, order & customer management, staff engagement, and payment statistics. The manufacturers in the market are engaged in developing such advanced software solutions that perform multiple business tasks with the incorporation of a single POS system. The restaurant POS terminals market is experiencing a high adoption of these terminals in QSR due to the rise in demand for the effective payment technologies that will allow the customers to make a hassle-free payment of their bills even at the time of cash unavailability. QSR includes several fast food outlets such as Mc Donald’s and Pizza Hut, which require payment systems that can perform the sales tasks at a faster rate to reduce the customer crowd at the counter. Moreover, these food outlets are witnessing an increased adoption of integrated fixed terminals that can perform multiple business tasks with maximum accuracy and speed. These application areas offer self-service options to the customers, where the customer needs to make orders and pay their bills at the counter, thereby driving the demand for fixed solutions. Asia Pacific is the fastest growing region in the market owing to the increasing number of QSRs. Countries such as India have people of different religions and castes, having different taste preferences and food specialties. This has resulted in the establishment of several restaurant types delivering such specialty foods. This increasing number of restaurant outlets in the country is encouraging global manufacturers to expand their business presence in the region and offer their diversified solutions in the market. 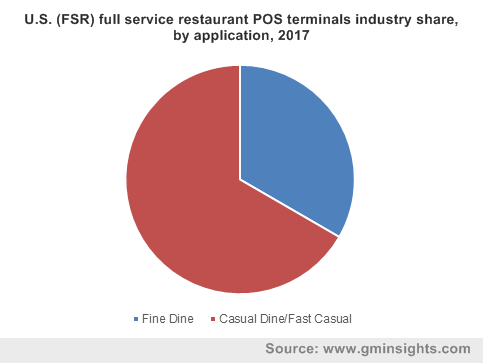 Moreover, increasing government regulations regarding the promotion and adoption of cashless technologies also provide an impetus to Indian restaurant POS terminals market growth. Digital India initiative by the government of India encouraged several restaurant outlets to incorporate POS solutions to offer cashless mode of payment options to their customers. Increasing awareness among people to adopt digital payment techniques such as debit/credit card payment and mobile wallets is accelerating the adoption of such advanced solutions. 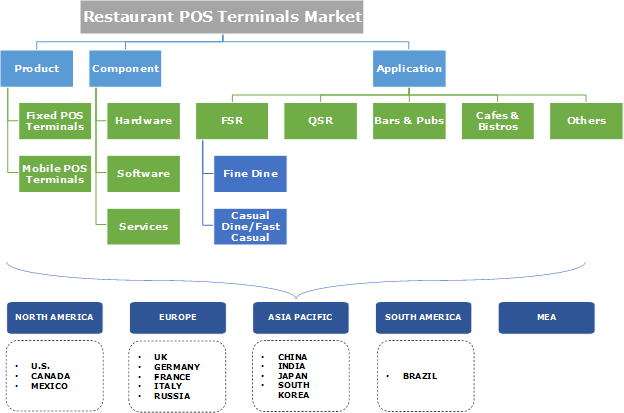 Key players operating in the restaurant POS terminals market are Diebold Nixdorf, Ingenico Group, Micros Systems, Inc., NEC Corporation, NCR Corporation, PAR Technology Corporation, Panasonic Corporation, Samsung Electronics Co., Ltd., PAX Technology, Square, Inc., Toast, Inc., TouchBistro, Inc., VeriFone Systems, Inc., and Toshiba Corporation, among others. The players are developing advanced hardware and software solutions that are developed based on the specific requirement of the restaurant industry. Moreover, they are also offering solutions that include several functions or features to support the specific business domain such as Pizza POS, Coffee Shop POS, etc. These companies are engaged in offering mobile technology as they witness high adoption across small restaurants. The manufacturers are focused on offering modern solutions by incorporating several innovative technologies such as EMV, biometric verification, contactless feature, and wireless technology. The restaurant (Point of Sale) POS terminals industry is dominated by some of the major players such as Ingenico Group, NEC Corporation, NCR Corporation, VeriFone Systems, Inc, and Micros Systems, Inc. These players are investing a large amount of money on R&D activities to develop innovative solutions that can be differentiated in terms of features or functions from the competitor’s offerings. Moreover, the increasing government regulations & policies in several economies are expected to impact the sales & business operations of the market players. For instance, the U.S. government is supporting and promoting the adoption of EMV-enabled terminals to ensure the security and safety of the monetary transactions in the country. Such initiatives are expected to drive the sales of the companies in the industry.